Bored of my usual granola bars, i decided to give Nature’s Path Organic Chewy Granola Bars a try. They come in many flavors, but i received the Flax Plus Pumpkin flavor to try. This bar has 0g trans fats, is WHEAT FREE, and is low in sodium. There are 15 grams of whole grain or more per serving, so i figured i would eat this bar with some raisins as a pre-workout breakfast. It’s a pretty hefty bar too, it’s thick, too, ( it’s 40g) which i like because i like to feel like i’m EATING something, not like i’m eating a thin nothing that won’t satisfy me. So after munching on a bite of this bar, the first word i thought of was YUM! It’s sweet, chewy and moist. There are flax seeds and pumpkin seeds dispersed throughout the bar, but they aren’t hard at all so they don’t take away from the chewyness of the bar. It reminds me of a healthier rice krispie treat with the consistency, but it’s very good. 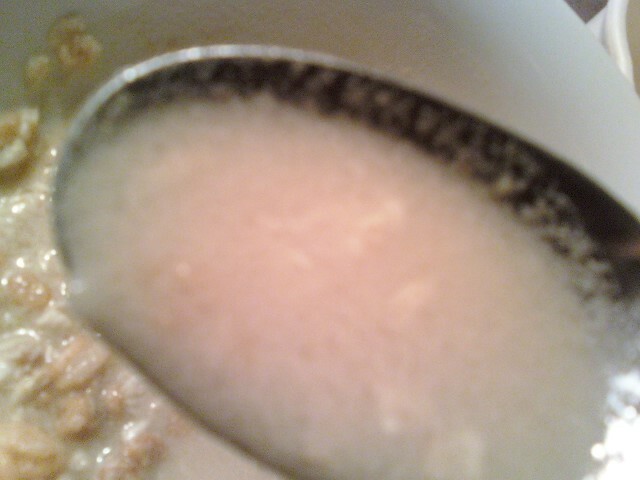 I think the sticky/chewiness is due to the organic tapioca syrup and invert cane syrup that are used in the bar. Each bar is 160 calories, 4.5 grams of fat, 37 carbohydrates, 3 grams of fiber, and 3 grams of protein. I wish there was a weee bit more protein, but i’m not complaining. This bar ROCKS! Organic tapioca syrup, Organic rolled oats, Organic brown rice flour, Organic evaporated cane juice, Organic pumpkin seeds, Organic invert cane syrup, Organic flax seed, Organic soy oil, Organic acacia gum, sea salt, Organic spice, Organic molasses, Organic rice bran extract. Craving some Mexican food, but hate the calories, fat, and artifical junk? Want something sinful tasting, but something you would regret? 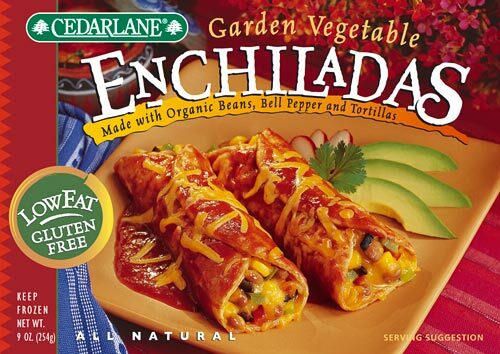 Look no further than Cedarlane’s Garden Vegetable Enchiladas! These babies are so good they only make you feel like you are eating at a Mexican restaurant, when really you are enjoying them from home! The corn tortilla tastes like the hard yellow taco shells you would get when eating out. I liked the outer layer, and i especially liked after it was cooked, the edges of each enchilada were a little harder/got crusty. It was yummy! The vegetables inside were cooked nicely, tender and full of flavor. I didn’t care too much for the onion, however. There are a few pieces of onion that are crunchy and they are STRONG. When you take a bite and there is a piece of onion in it- you’ll know! The peppers add a nice touch, and are definitely responsible for the “spicyness” of the dish. There are also pinto beans with the vegetables, and i’m not usually a fan of beans, but there was just the right amount of them in the enchiladas. Lastly, the sauce. One of my favorite parts. It’s savory, tomatoe-y, a tad spicy, but also sweet. It’s really good! I found myself running my finger on the carton after i finished my enchiladas to eat the remnants of the sauce. De-lish! Overall, i would definitely get this again and reccommend it highly. It’s very satisfying and packs a nutritional punch with low fat, and high fiber/protein. Each enchilada is 140 calories, 3 grams of fat, 20 carbs, 3 grams of fiber, 9 grams of protein, and provides 20% of calcium needs. There are 2 enchiladas in the tray. My only complaint was that i wish it was a little more cheesy. I did get one REALLY good bite that had a lot of cheese, but other than that, there isn’t too much cheese flavor. Regardless- GET THIS MEAL! Enchilada Filling (rennetless non fat cheddar cheese, organic bell pepper, organic pinto beans,rennetless cheddar cheese, organic corn, green chilis, onion, black olives, herbs and spices, salt), Enchilada Sauce (filtered water, organic tomato puree, sweet rice flour, herbs and spices, honey, salt), Organic Corn Tortillas. Ah, toaster pastries. Soft crust, chewy, sweet filling, and sugary icing. So sweet, and so yummy. 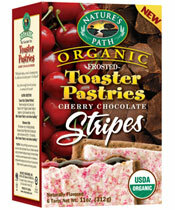 So when Nature’s Path sent me Organic Toaster Pastries, I was EXCITED. So, I thought to myself, just a bite, and i’ll finish it and do the review tomorow. NOPE! These were too AWESOME not to finish. I couldn’t stop at one! (who can, really?) The pastry is chocolatey and actually not white and crumby looking. The chocolate and cherry flavor together is amazing, not over powering at all. The cherry flavor isn’t really sour nor sweet- it’s just right. And the chocolate flavor has more of a dark chocolate taste. I had mine without heating it up (it was 12 at night…), but i’m sure it would be delicious in the toaster over-maybe even better. So after devouring a package, i felt truly satisfied. These were SO GOOD. 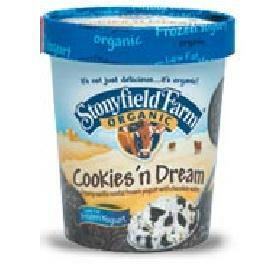 Nutritionally, they are all natural/organic, and 0g trans fat. 1 pastry is 200 calories, 4.5 grams of fat, 38 grams of carbs, 1 gram of fiber, and 3 grams of protein. i just wish there were a *tad* lower in calories (I’ll even take 150!) and had a little more fiber for satiety. But they are just too good! Organic wheat flour, organic evaporated cane juice, organic evaporated cane juice invert, organic palm oil, organic whole wheat meal, organic fair traded cocoa, organic sour cherries, organic apples, organic corn starch, organic dextrose, leavenings, organic vital wheat gluten, sea salt, organic pomegranate juice concentrate, organic honey, organic molasses, organic rice bran extract, colored with betalains paprika extract, organic cherry flavor, citric acid, whey protein concentrate (milk), organic vanilla flavor, algin, sodium citrate, monocalcium phosphate. So normally in the afternoon i have a yogurt (ahem, Stonyfield or Wallaby Organic. yum!) for a snack with something else that’s little, a handful of cereal, a cookie, etc. But today (after a grueling workout at the gym this morning) I was RAVENOUS! So i thought i needed something a bit more substantial than my normal yogurt. 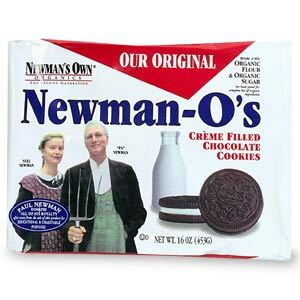 So, i decided to give Newman’s Own Organic Soy Crisps a try. Okay now before you say EW, SOY IS GROSS, don’t even think about it. Soy crisps taste pretty much like rice cakes-but are healthier and have more satiety packed with them due to the soy protein and isolflavins that soy provides. 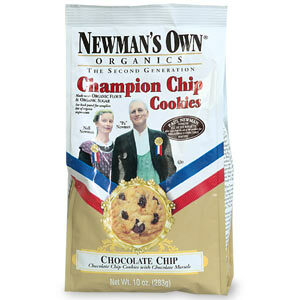 I have three of Newman’s flavors (which they so generously donated! ), Cinnamon Sugar, White Cheddar and Barbeque. They also come in a lightly salted flavor. Barbeque-tastes just like barbeque chips! My mom even asked for more after i let her try a few (which of course i declined her- get your own bag! 😉 ) There is a subtle sweetness to the BBQ flavor, but you can taste garlic and tomato flavors as well. These were good! White Cheddar- just the right amount of seasoning. Not too heavy, not too light. They are cheesy too, and a tad salty. You will need some water with these!! These soy crisps are definitely a lot healthier than other chips or pretzels that people grab for a snack in the afternoon. In 1 oz. (which is about a small bowlful- a good sized amount), there are 110-120 calories, 2.5-4 grams of fat, 13-15 carbohydrates, 3 grams of fiber, and 7-9 grams of protein. Needless to say i was definitely satisfied after eating these-they quenched my hunger quite nicely. The Cinnamon Sugar Flavor also hit the spot for the fat/sugar laden craving i have been having for Auntie Anne’s Cinnamon Sugar Hot Pretzels lately in a much healthier way. I’m going to be buying these quite often! Cinnamon Sugar-Organic Low Fat Soy Flour, Organic Rice Flour, Salt, Seasoning (dehydrated cane juice, cinnamon and not more than 2% silicon dioxide and vegetable oil added as a processing aid), Sunflower Oil. Barbeque-Organic Low Fat Soy Flour, Organic Rice Flour, Salt, Seasoning (dehydrated cane juice, sea salt, onion powder, garlic powder, tomato powder, extractives of paprika, natural flavor, spices, citric acid with not more than 2% sunflower oil and silicon dioxide added), Sunflower Oil. White Cheddar-Organic Low Fat Soy Flour, Organic Rice Flour, Salt, Seasoning (cheddar cheese [cultured milk, salt, enzymes], whey buttermilk, salt, disodium phosphate), Sunflower Oil. *Sigh*. This, unfortunately, is going to be my first not-so-great review. Bored of my usual granola for breakfast, i picked up some of the Enjoy Life Cran-Apple Crunch Granola. 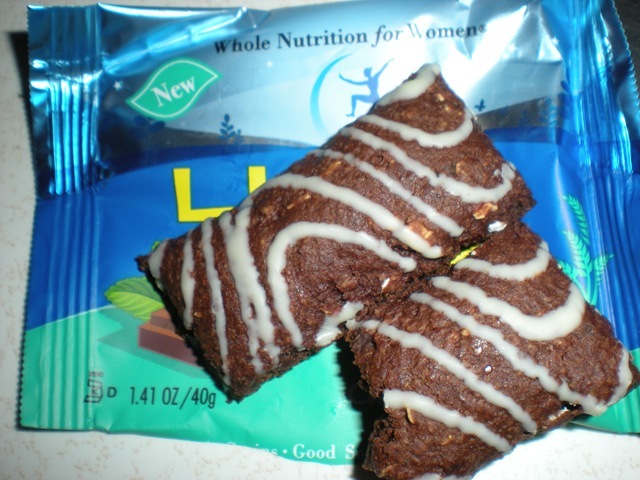 Enjoy Life makes products that are pretty much completely allergen free. The granolas are gluten free, soy free, dairy free, nut free, and casein free. Oats bother my stomach a little bit, so I figured I’d give this a try. I already tried a snickerdoodle cookie by Enjoy Life and that was DELICIOUS, so I figured this couldn’t be too far off.